Mix butter and sugars, until light and fluffy. Add the eggs and extract, mix well. Add the flour, salt, baking powder and mix until a smooth dough is formed. Stir int he chocolate and the pecan nuts, until evenly dispersed. Preheat oven to 170 degrees celsius (325 Fahrenheit/ Gas3). Take a heaped tablespoon and make a ball, flatten slightly onto a prepared baking tray. Make sure the biscuits are spaced apart to allow for the spreading when they are baking. Bake in the preheated oven for 15minutes, or until golden brown around the edges. Leave them to cool, before removing them onto a cooling rack to cool down completely. The biscuits will be a combination of crunchy and soft in centre! 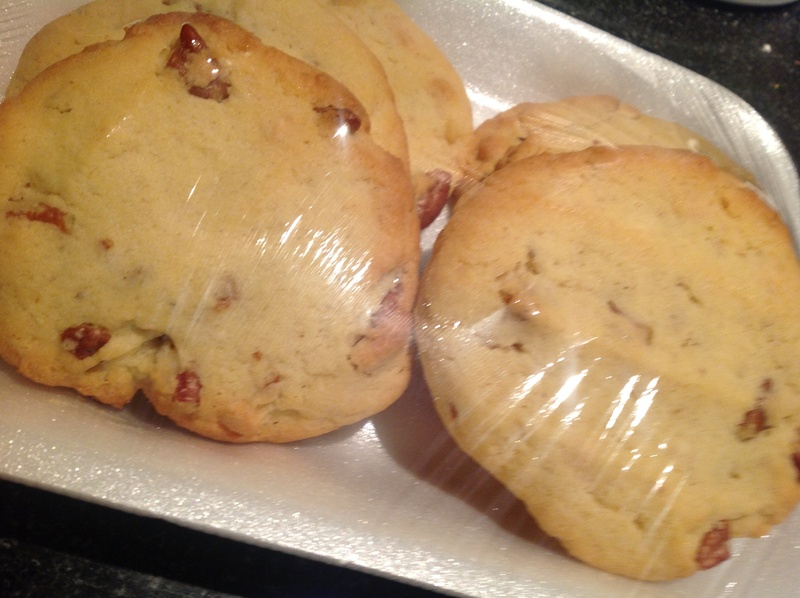 This entry was posted in Baking as easy as 1..2..3 and tagged biscuits, nuts, Pecan chocolate biscuits, pecan nuts, white chocolate by angelb38. Bookmark the permalink.